When life takes an unexpected turn through death, illness, or another personal catastrophic event, financial hardship and serious financial jeopardy can follow close on its heels. 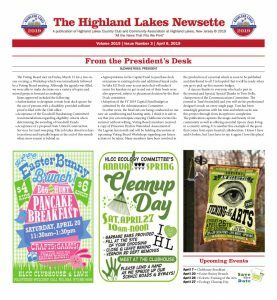 When such events befall a member family in Highland Lakes, that family can anonymously turn to the Goodwill Fund to appeal for assistance with the payment of their dues and assessments for one year, helping to maintain their membership in good standing. 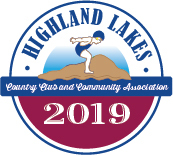 Payment of annual Club dues is the responsibility of every property owner in Highland Lakes. Club dues and assessments are established each year by the Voting Board, which bases the fee schedule on the Club’s anticipated operating expenses to maintain our lakes, roads, beaches, activities, provide other amenities that are offered to its membership throughout the year, and fund special projects and reserve accounts that are maintained so that the Club can responsibly respond to unexpected emergencies as needed. Initiated in 2005, the Goodwill Fund holds money in reserve that is raised through membership donations and benefit events organized throughout the year to help qualified member families who are unable to pay their dues. Each year, families that apply and are deemed to meet the guidelines for assistance through this fund are helped thanks to the generosity of so many of their neighbors. Though donations to the Goodwill Fund are not tax deductible, all members who are in a position to contribute are encouraged to do so when they remit their own Club dues. Since its founding, the Goodwill Fund has provided nearly $75,000 in assistance to more than 65 Highland Lakes families. Supported entirely by the voluntary contributions from Highland Lakes members, outstanding fundraising efforts (Community Yard Sale / the Path to Goodwill), and contributions from various Club organizations and activities, we are proud to have helped members maintain their membership in good standing as they suffer from a serious life event. Over the years most applications have resulted from a severe family health crisis or the death of a spouse or partner. Other Highland Lakers have suffered from a house fire or hurricane. We understand that the circumstances of severe family event are unique. Financial hardship alone does not qualify a member to be considered for assistance. Regrettably there are many families who have suffered job losses and/or layoffs that place serious financial burdens on the family. While the situation is difficult, an “economic” event alone does not make one eligible for a Goodwill Fund award. If, however, you are a member in good standing and have lost a significant amount of your family income due to the death or serious illness of a family member and you are unable to pay your annual Club dues, contact the Club office in writing, c/o the Goodwill Fund. Have a friend or neighbor in Highland Lakes who you believe may qualify? Please reach out to them and encourage them to file an application. The deadline for applications is July 31st each year. Your request will be confidentially considered by a designated member of the Goodwill Fund and presented anonymously to other committee members. Goodwill Fund committee members evaluate every request with respect to the established criteria and forward their recommendation to the Voting Board who make the final decision in a meeting that is closed to the public. Once a decision is made, the committee coordinator notifies the applicant. If you believe you may qualify please consider submitting an application to the Goodwill Fund. 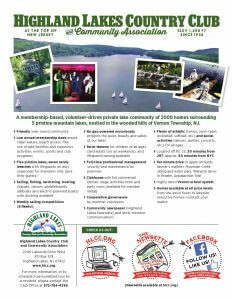 Stop by and pick up an application at the Club office. You may also call the office at 973-764-4366 and an application will be sent to you. The application deadline for the Goodwill Fund is July 31 each year so please do not wait. All inquiries and all applications are kept completely confidential.